As Rowan Atkinson returns to the stage in Oliver! Martin McGrath talks to him about his career, his relationship with Equity and how Cameron Mackintosh finally persuaded him to take the role of Fagin when he doesn’t like musicals and he once swore he’d never return to the West End or a long run in the theatre. As preparation for our meeting I did some research on Rowan Atkinson, reading the relatively few, and relatively short, interviews he has conducted with the national press in the last few years. It wasn’t an encouraging experience. The journalists who wrote those articles paint a picture of a man who is intensely private and therefore reluctant to talk about anything for very long. The image that comes across is not of a rude man but one who is uncomfortable in the limelight, despite his enormous successes. It is clear he has little time for the usual rigmarole of celebrity and self-promotion. Many of the journalists who had preceded me seemed to have come away with precious little to write about. As I was led up the steep steps and narrow passages of the backstage area of the Theatre Royal Drury Lane, ducking between the layers of ersatz Dickensian London that form the backdrop for the latest production of Oliver! –in which Rowan has won rave reviews for his performance as Fagin – I was clutching my list of questions and wondering what sort of reception I was going to receive. I caught Rowan between matinée and evening performances. He’s wearing half his costume and still in make-up, but he seems remarkably relaxed. I’m welcomed into his dressing room – which was refurbished just before the beginning of this production and is a surprisingly comfortable and spacious area. He jokes about the relative luxury he’s enjoying and far from the reticent, perhaps reluctant, interviewee I had been expecting, he’s happy to speak at length and with great passion on the issues that matter to him. I first ask him about his membership of Equity. He’s been a constant and full-paying member of the union for thirty years. I ask him what Equity membership means to him. Working on Oliver! means working with a large cast of very young performers who are going to experience very different careers in a rapidly changing industry. I asked him what it was like working with all those young people and whether he felt he’d learned anything from the experience. In my research I’d read that Rowan’s previous experience of performing in a long run in the West End had left him swearing never to take on a long-term commitment to live performance ever again. I asked him what it was about his previous run in the West End that lead to his absence from the stage for two decades? I put it to him that he is also on record as having said that he didn’t like musicals. So how did he end up back in the West End, committed to a long run, and singing and dancing in a musical? “Why am I here doing this? It is largely because of the role. 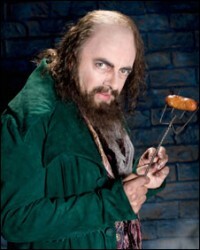 There’s a letter here from me to Cameron, which Cameron kindly framed, in which I told him I didn’t want to play Fagin. He first asked me in 1993 and he talked about doing it for nine months or a year and I’d had that Chekhov experience and thought: over my dead body. So I went off the idea. Then I told him no again in 2007. Cameron Mackintosh’s persistence and reputation seem to have had a significant influence on his decision. This production of Oliver! is notable for having had the parts of Nancy and Oliver cast through the television talent show I’d Do Anything. I asked Rowan whether he’d watched any of the programme and what he made of it as a way of selecting a performer to appear in a West End production. It’s a system of casting that has been very controversial with Equity members. As we’ve already noted, Rowan Atkinson is famous for his reluctance to step into the public eye and has avoided the exposure in the press that usually accompanies the kind of success he has enjoyed. One issue, however, seems to have drawn him into the public arena again and again over recent years – freedom of speech. He’s been a vigorous campaigner against the Labour government’s attempts to restrict free speech through bills such as the Race and Religious Hatred Bill – which would have created the offence of “Incitement to Religious Hatred”, a measure which would effectively have made it a crime to make fun of, or criticise, any religious belief. Rowan is quick to make the point that he’s opposed to racism: “It’s ridiculous and patently irrational to criticise someone because of their race” but believes that the freedom to criticise ideas (whether they are articles of religious faith or not) is, and should remain, a basic right in a free society. It was the scope of the legislation, not its purpose that stirred Atkinson. And Rowan rejected the idea that religious groups should have a right not to be offended. Having campaigned successfully to get the government to amend its legislation on the religious hatred bill, Rowan Atkinson found himself fighting a similar cause just a few months later. This time the government, working with groups promoting fairer treatment for gay and lesbian groups, proposed to create an “anti-homophobia” law. I asked him , given the controversy he’d been involved in and some of the criticism that he’d attracted for his stance, whether he’d worried about taking on the role of Fagin – a role that has sometimes been controversial for its portrayal of a Jewish character in a stereotypical light? Finally I ask him whether, after success in television, film and theatre, he still had ambitions left. He laughs. My stock of questions has been depleted but time has flown by – the interview has taken much longer than intended, but Rowan has been incredibly generous with his time. I pack my things up and as I make to leave I can’t help admiring the striking oil painting of two Formula One cars on his dressing room wall. Rowan is famously a fan of motor racing and of fast cars. It’s only as we make our way back through the theatre’s plywood streets of the Dickensian London portrayed in Oliver! that it occurs to me how perfectly that statement summed up my experience of the interview. In person Rowan Atkinson proved to be nothing like the way he has been painted in the press.